Why The Service Desk Needs A "Customer-Savvy Approach"
The I&O function within your business is facing increased challenges and pressures. These challenges have been shaped by three market forces: 1) Business-ready, self-service technology, 2) Empowered, tech-savvy employees and 3) Radically more complex business environment. These forces threaten your Service Desk's very existence and the solution in order to embrace these challenges is to adopt a "Customer-Savvy Approach" - simple, or is it? This panel led discussion firstly looks to define what a "Customer-Savvy Approach" is; secondly, looks to address the steps I&O Leaders need to take to move to a "Customer-Savvy" Service Desk and thirdly, how to measure success in the adoption of this strategy. 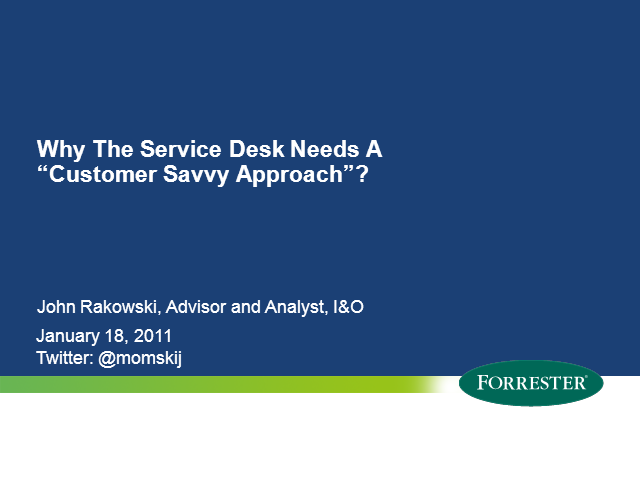 Title: Why The Service Desk Needs A "Customer-Savvy Approach"